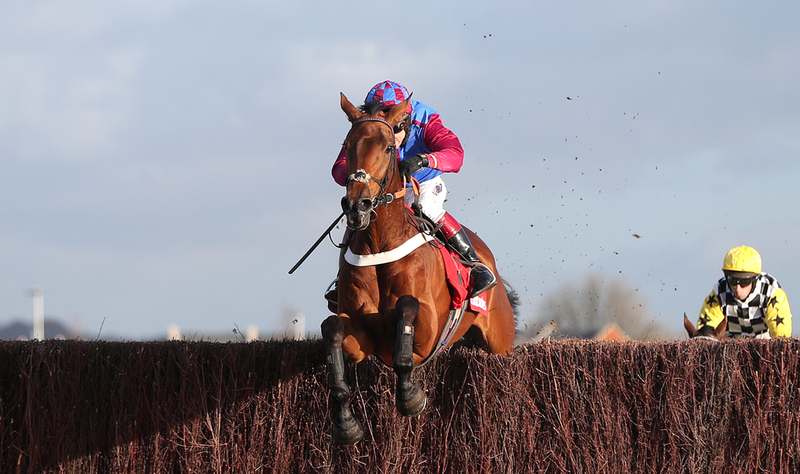 La Bague Au Roi went on to take the the Kauto Star Novcies Chase and her first Grade 1 over fences in her career. The eight year old mare only took to chasing this season and has gone on to land a black type in just her third start over the bigger obstacles. After a superb round of jumping which only saw her make one mistake and the third last the did brilliantly to show tenacity to get back up and land the spoils at Kempton from the Paul Nicholls trained Topofthegame. The Warren Greatrex trained La Bague Au Roi raced in third behind the two outsiders of the field who were predicted to fly away at the start but did not set a strong Gallop and the mare loved how the race was set up. With her strongly coming through to the front in the final stages the pace was to strong for Bags Groove and favourite Santini who fell away leaving the battle at the front between Topofthegame and the eventual winner. A mistake three out by the leader left Topofthegame in command but La Bague Au Roi was a gutsy rival and fought back for a one-and-a-half-length win at 8-1. (Credit Racing Post) Delighted trainer Warren Greatrex said: "Unbelievable! She’s the best you’ll get. “We could have gone for easier options but decided to come here and take on the boys and she’s jumped them into the ground. Her jockey Richard Johnson added: “She’s a star and jumps so well. To be fair to her, I went for a long one three out and she was cautious and looked after me. At the last and second-last she was very brave. She deserved it and is a top-class mare." She has now been slahed in the betting for the RSA Chase at the Cheltenham Festival with most bookmakers to 8/1 from 14s.